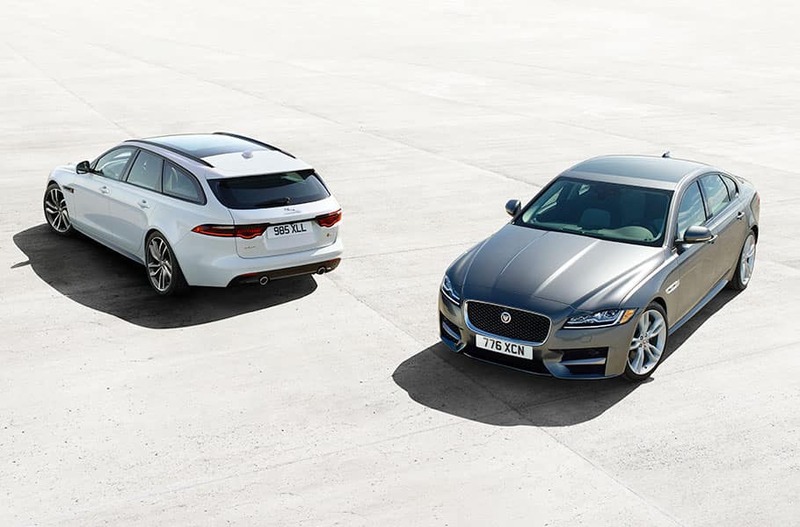 The 2018 Jaguar XF sedan and 2018 Jaguar XF Sportbrake are exactly what Colorado drivers are looking for in a midsize luxury sedan or luxury wagon. British heritage plays a significant role in the design of these amazing vehicles. The all-new Jaguar XF Sportbrake take the sedan design and enhances everything for a bigger and more powerful vehicle. 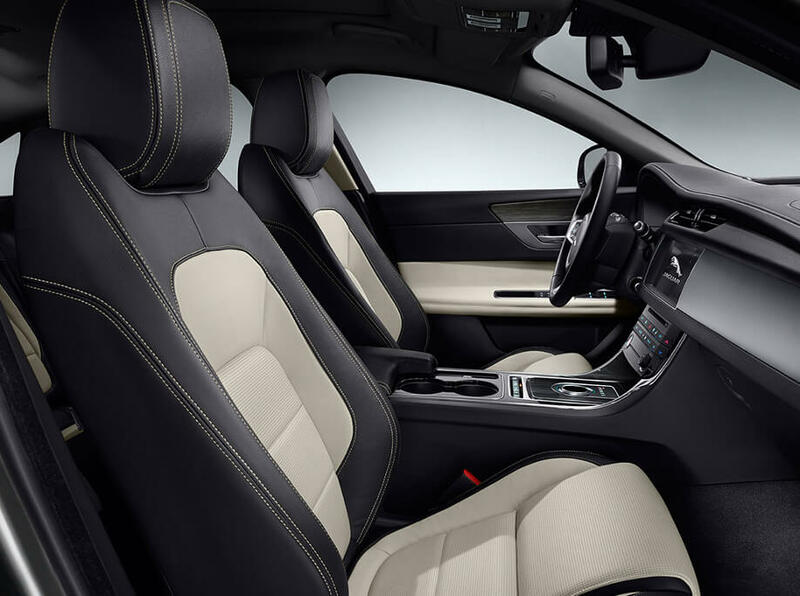 Excitement and comfort are the primary driving forces behind the Jaguar XF. These two incredible vehicles are packed full of technologies that keep you connected, safe, and entertained. 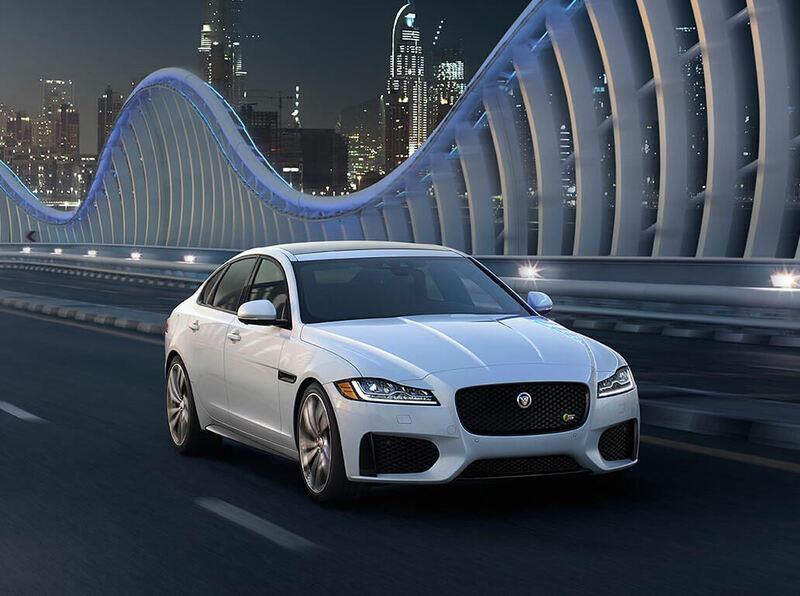 In order to experience the 2018 Jaguar XF Sedan or Sportbrake, you must visit Jaguar Colorado Springs, your Southern Colorado area Jaguar dealer. If power is what you are looking for, power is what you will get in the 2018 Jaguar XF Sedan. The 2.0L Turbocharged 4-cylinder engine has 247 HP standard. This engine gets an amazing 25 MPG city and 34 MPG hwy for a combined 28 MPG average fuel efficiency. The available 2.0L 4-cylinder diesel comes with 180 HP standard. This engine boosts fuel economy to 31 MPG city and 42 MPG hwy for a combined 35 MPG average fuel efficiency. Either choice of engine will prove to be a wise choice. The 2018 Jagaur XF Sportbrake takes the power equation up a notch with the standard 3.0L Supercharged V6 with 380HP and 332 lb-ft of torque. Both models, the S and the First Edition come with Jaguar’s all-wheel-drive (AWD) system. All this power is mated to the always-incredible 8-speed ZF Automatic transmission. The result is a 121 MPH top speed and a 0-60MPH time of only 5.3 seconds. This engine gives an average fuel economy rating of 18 MPG city and 25 MPG hwy with an average 21 MPG combined. These numbers are made even more impressive considering the performance based nature of this amazing 380 HP luxury sports car. All-Surface Progress Control allows full control of your XF in all types of weather. Plus, Adaptive Surface Response Mode augments all-wheel drive models by minutely adjusting the transmission, stability control, brakes, and throttle for ideal handling and responsiveness. Safety and protection is one of Jaguar’s primary strengths. The wealth of driver assistance features in the XF truly makes your daily drive safer in every way. The Jaguar XF has an available emergency braking system that detects slower or stationary objects in front of the vehicle. If you approach too quickly, an audible warning is given. If no reaction is detected, the XF will automatically apply the brakes for you. Also available is the Jagaur Advanced Parking Aids system. This allows you to park in the tighest spaces perfectly – every time. The XF can even read road signs! Traffic Sign Recognition technology reads upcoming speed limit and no-passing signs and displays them on the dashboard. Further safety features include an engine immobilizer, child seat anchors, and dual front side-mounted airbags. The 2018 Jaguar XF is loaded with multiple advancements in safety, entertainment, and convenience. The first thing you will see when you start your XF is the Head-Up Display with laser technology. This system projects your speed and the detected speed limit onto the bottom of your windscreen. Jaguar InControl Touch and TouchPro: Jaguar InControl allows you to be in complete control of your driving experience. This advanced infotainment system lets you keep track of your vehicle’s fuel and safety status on your smartphone, control your favorite smartphone apps on an intuitive touchscreen display in the car, and send navigation instructions directly to the Jaguar XF. This amazing 8-inch screen allows you to use common touch and swipe controls, along with pinch to resize. The TouchPro system upgrades your screen to 10.2″ and adds an amazing 12.3″ TFT HD digital instrument cluster. Driver Assist Features: Staying safe is significantly easier with the driver assist tech integrated on the 2017 Jaguar XF. Autonomous braking uses advanced sensor technology to recognize when a vehicle or object in front of you is getting too close. Advanced parking aids use sensors to facilitate difficult parallel and perpendicular parking maneuvers. You’ll also get lane keep assist with driver condition monitoring to help you stay on track. 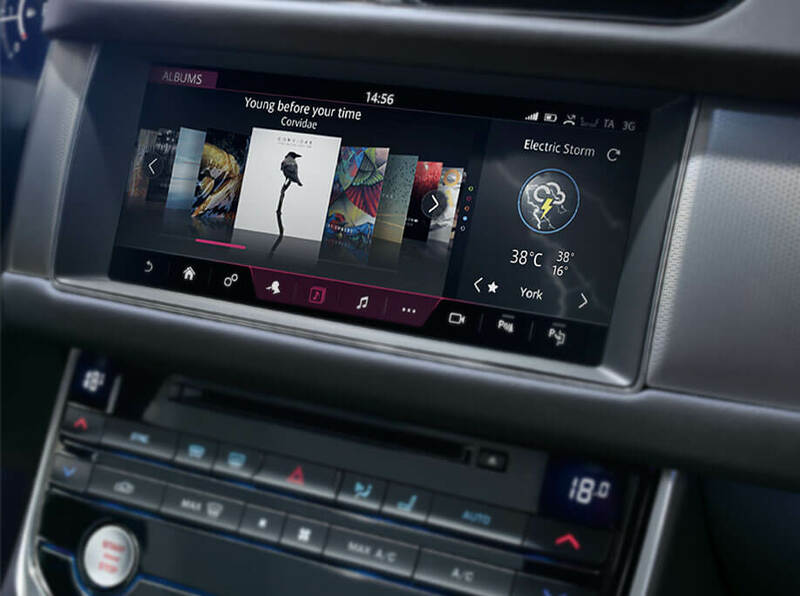 Meridian Sound Systems: Whether you go with the standard Meridian 380 watt sound system with 11 speakers, or the larger 825 watt Meridian Surround Sound system with 17 speakers, you’ll get superior British audio with your Jaguar XF. The speakers have been placed to provide all passengers in the car with a rich, crisp, and full-bodied audio experience. 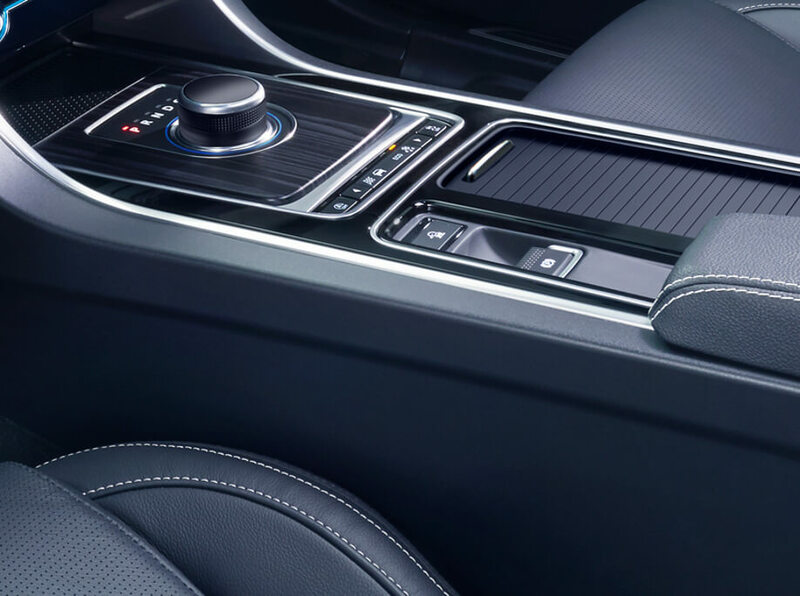 Jaguar InControl® offers a Wi‑Fi Hotspot that utilizes a powerful external antenna – allowing passengers to wirelessly connect up to eight devices with the in-car Wi‑Fi network. The 2018 Jaguar XF Sedan and Sportbrake are available now for your enjoyment. Ultimate comfort, amazing power, efficient engines, luxury and performance combined. Come see one and drive one today at Jaguar Colorado Springs – we’re located near Cheyenne Mountain, in Motor City just south of where I-25 and Highway 24 intersect in Motor City. We’re open Monday through Saturday, and you can contact our sales team if have any questions.